Designed by Thomas Coward, the Latis Collection will have its official release date on December 2009. 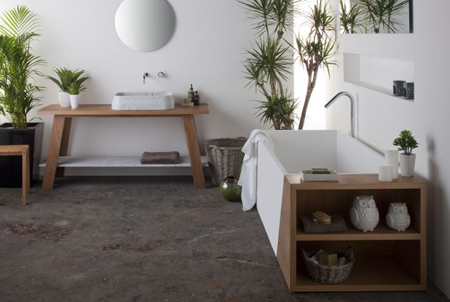 Designed for Australian manufacturer, Omvivo, the Latis bathroom collection is composed of various bathroom fixtures including the washbasin, bathtub, and more that will surely work out perfectly on your contemporary bathroom. Bathroom is considered to be the most peaceful place in our homes. Aside from making you feel relieved with the cool ambience it has, your bathroom is also a perfect place for relaxation meditation and some other activities that needs silence. However, this time around, your bathroom can now be a perfect wellness center at the comfort of your own home. The 2nd floor vanity unit from German manufacturer Duravit is just one of the beautiful bathroom that will definitely turn your then simple bathroom into a complete wellness center with its ceramic tub, washing area, furniture, cabinets, and more. Cerasa brings beautiful curve and texture for their bath vanities collection of 2008. Take a look at the block construction of the units, you will find that these vanities has up to date appearance whilst ensuring faultless functionality. 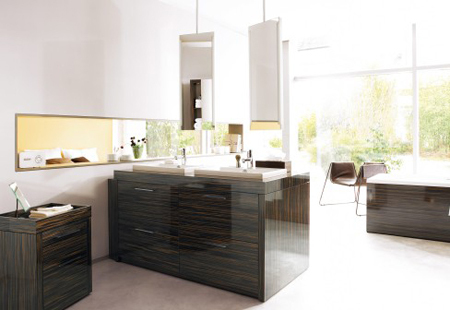 Cerasa bathroom vanities also offer you wood-finished, you can choose light bamboo or hefty ebony, and for the color, there are deep purple or crisp white. Luxury bath vanities also available if you prefer, gold-finished and silver-finished surely can add luxury touch in your bathroom. The Max Vanity that is all about smooth and fine lines is another product from Novello. It has a wooden front that flows with the effortlessness of running water. The perfectly coaxed material into a wavy line adds the beauty of the product, and the gliding out of the drawers reveals lots of storage that makes this usable piece of art retains practicality. The top part of Max Vanity is glossy and its touchable surface adds a crisp clean feeling. You can choose a sink from a heart-shaped one or with an asymmetrical impression, or the ones that is uninterrupted by lines. Totally modern bathroom design from Rapsel. Vision washbasin and Arne bathtub, both have futuristic forms to give high design and modern appeal to your bathroom. Arne bathtub is a tribute to 1960’s chairs designed by Arne Jacobsen, with its distinctive and supportive back rest feature, this bathtub made of entirely titanic resin, create an iconic item to your bathroom. While the vision washbasin will definitely captivate your guests, the crinkled paper effect of the entire body of the vanity creates unique appearance, round or oval shape. Light shines through from within, highlighting the unique material of the vanity and allowing it to function as a welcoming nightlight feature. If you desire for cutting edge modern bathroom design to reflect your personality with its originality, this bathroom collection from Rapsel is your great choice. Though this bathroom vanity is interpreted of the shape of a flower, but I think it has a unique shape of amoeba. Modern, abstract, and interesting design. I think kids will love this shape, they are bored with square and round shape of bathroom sink, this definitely will catch their eyes. 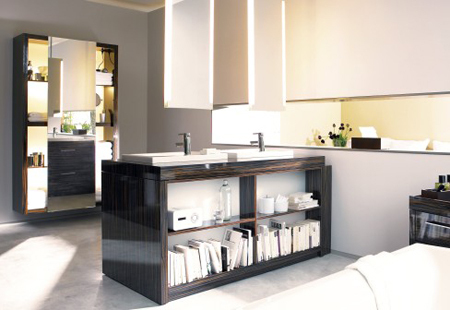 Two-legged vanity that is ideal for bathroom came from Artelinea. This bathroom vanity is mounted against the wall on two beautiful shaped legs, the Metafora bathroom vanity stands out as an object with panache. Metafora bathroom vanity comes in classic or neutral style, gleaming in black and white, which make perfect combination with other contemporary decor elements, especially classic bathroom design.